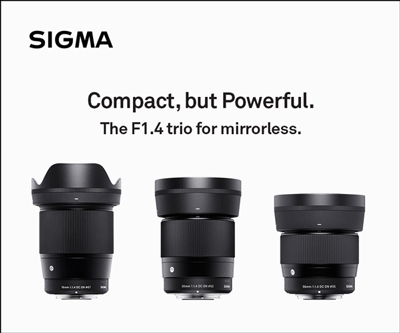 Will the SIGMA F1.4 Trio of lenses for mirrorless cameras work on full frame? by David O’Dwyer of DOD Media Ltd.
David O’Dwyer is the founder of DOD Media Ltd., a production company located in Oxford with the goal to “Imagine, Create, Shape and Share”. He produces very informative YouTube videos including this review of the SIGMA 16mm F1.4 DC DN | Contemporary, SIGMA 30mm F1.4 DC DN | Contemporary and SIGMA 56mm F1.4 DC DN | Contemporary lenses. David often gets asked whether the SIGMA F1.4 Pro Trio lenses designed for mirrorless cameras will work on a full frame camera. So he has produced this very informative YouTube video to help explain the Yes & No answer. Featured product: SIGMA 16mm F1.4 DC DN | Contemporary, SIGMA 30mm F1.4 DC DN | Contemporary, SIGMA 56mm F1.4 DC DN | Contemporary.